Thanks so much for sharing the picture and story about your German Shepherd Dog Simba and his favorite sport - football. That is excellent! My GSD Rodie is a master soccer player. He can stop his ball on a dime, reverse directions, dribble and more. I think he could easily play at the Olympics - he's just that good! LOL!! So hanks again for sending in your story about Simba. He looks to be one big dude! And I'm sure he is a great pet to you. 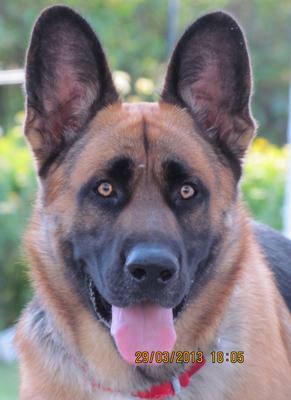 Continued success with him and feel free to send in more pictures, videos and stories about your German Shepherd because we love to read about them. Thanks so much and I wish you lots of success with him. I just cannot believe that your Simba loves football. He is looking quite stronger and good on playing football. Thanks for sharing about your pet. Really you are having a very nice pet. I have adopted a puppy last month and I am expecting him to be like your Simba. Can you tell me how you grown him up? Can you just suggest me some other tips to take care of my puppy? Simba really looks like a jock. This must be the best time of year for him.